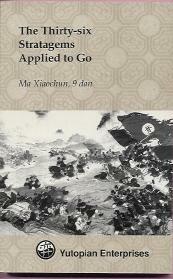 The Thirty-six Stratagems Applied to Go is a book by Ma Xiaochun, published by Yutopian. As the title suggests, it applies the 36 stratagems to go. Every plan includes an oversight by the opponent? Sacrifices can be amazingly large, if only you know what you're doing and your plan is backed up by profound reading. Less surprisingly: let your strategy be based on positional judgment. Even if there is no direct impact on one's skill after reading this book, it is one of those books which remain interesting even at the x-th reading. SunZi can employ the more general stratagems which can be also employed/derived in/from general life. Niklaus: Acutally, Secret Art of War and SunZi's Art of War are not the same. Harro von Senger (s. below) coins the term stratagem (not the misused and less general strategy; a stratagem is a clever, sometimes unconventional solution to a problem, hence can also be tactics) states that Western population misses the general awareness of cunnings (? = Deutsch: List) because it has not categorized them (as rigorous as the Chinese), but therefore has rhetorics . I read the book, found it very interesting, however, of course disaprove the generalizations (it sells better?). They are mostly about deception of some sort, and therefore this approach to the game is 'darker' than the accepted Japanese interpretation of Go as artistic in nature. The Ma Xiaochun book makes a reasonable case that these ideas are inherent in high-level play, though some of the stratagems may be applied in a less artificial way than others. HolIgor: Recently, browsing in the bookshop I noticed Secret Art of War with application to business. 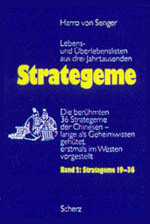 The cover featured an ancient Chinese sage and a modern executive facing each other across a go board. The stones on the board looked neat, shiny, glossy, appealing. The position on the board was ridiculous. Art of War in not such a good translation of the term bing fa 兵法, as fa 法 does not have anything to do with art, more with (the correct) method, rules, the law. Sun Zi sees War as a necessary evil which nevertheless is of utmost importance to the state and has to be dealt with with in a professional manner.